Who are those people in your life that you love to see coming and that you love to see going? Which category do you fall into and why? Life can get a hold on you and not let go or you can get a hold on life, strap in, and stay focused on the destination. 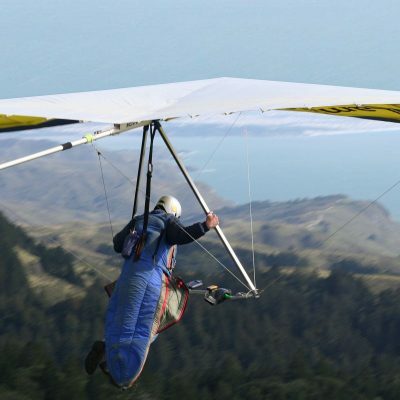 This morning on the way to take Tyler to school, I heard a story about a hang glider who made sure his video camera was strapped on properly and everything else necessary for a successful hang gliding experience except one thing…himself. He forgot to strap himself onto the guide and the hang glider itself. Talk about hanging on for dear life. At one point, he told the guide that he didn’t know how much longer he could hang on! The guide assured him that they were almost there and that he could hang on a little longer. He did. In moments like this, we can certainly figure out how much strength, determination and focus we have to hang on to ensure that we arrive safely on solid ground. We can play the blame game which NEVER accomplishes what needs to be accomplished or we can take responsibility each day moment by moment. All of us know that life is fast, and we all mess up or miss out on important things that we wish we had a do over. If we want life to slow down, I wish I could say, just tell it to slow down, but life doesn’t work like that. We need to slow our lives down, take a breath, pause, pray, look around and share your thankfulness WITH the source of the one who created life. If you want a strong, devoted, unified family, then be a strong, devoted, unified family member. Invest. If you want to be more joyful, then fill your life with joy, which happens to be God Fruit. Change your mindset. If you want to stop being sad, then get on your knees and ask for help. Pray. The consistent amazement to me about this one is that God doesn’t put a toy in front of me when stress or disappointment hits, but he sends Godly people to help through this process. If you want life to slow down, then slow down. Give hugs freely and generously. Smile. God is a storm calmer by uttering 3 words…Peace, Be Still.